This is a lovely moist sponge with a strong tang of citrus and juicy sultanas. 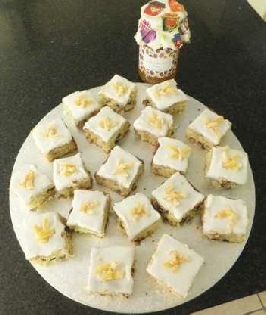 Topped with lemon icing and crystallised orange, it is a real tea time treat! You will need an 11 x 7" tray bake tin and lining paper. 226gms S.R. Flour - sifted. 1. Cream the fats and sugar until light and fluffy with the grated fruit zests. 3. Beat in the eggs, adding a little flour if the mixture appears to be curdling. 5. Pour the mixture into the tin which has been greased and lined with baking paper. 6. 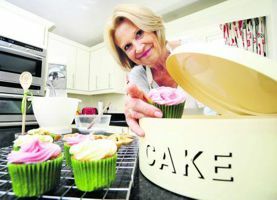 Make a slight dip in the centre to ensure the cake is level when baked. 7. Bake at 180° for 25 - 30 mins. 8. Cool slightly in the tin and then on a wire rack. 1. Using a potato peeler peel the skin from an orange in strips and going from top to bottom. 2. Cut into finer strips. 3. Place in a small pan, cover with water and bring to the boil. 4. Drain and rinse the orange strips in cold water. 5. Repeat this process once. 6. Place 120mls water in the pan and add the sugar. 7. Stir until the sugar is dissolved, then re add the orange. 10. Shake until all covered in the sugar, tip out and place on one side. Place the icing sugar in a bowl and stir in the lemon juice, the icing should be of a good spreading consistency. If too stiff add a little water, if too soft add more icing. Spread the icing on to the cake taking care to go right to the edges. Carefully measure out the portions that you want from your bake and place crystallised orange pieces in the centre of each square.